::: AS SEEN ON TV PRODUCTS | CLEANING | OXICLEAN MIRACLE FOAM | OXICLEAN MIRACLE FOAM SPRAYS 2 PCS. New OxiClean Miracle Foam Spray is a thick, oxi-powered multi-purpose cleaner that tackles the toughest grease, soap scum and grime all around your house. This unique, truly multi-purpose foaming cleaner makes your cleaning jobs easier and more efficient with its grease fighting formula that also works in your bathroom on soap scum and grime. Use it on your kitchen appliances, countertops and bathroom areas, as well as your windows and mirrors for a streak-free shine, each and every time. This powerful cleaner has a light scent and can be used without gloves to make this the most easy to use and convenient everyday cleaner. 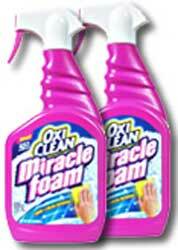 BOOKMARK THIS PAGE OxiClean Miracle Foam Sprays 2 Pcs.